enthronement of King Mohammad VI of Morocco was celebrated at a hotel here on Saturday. 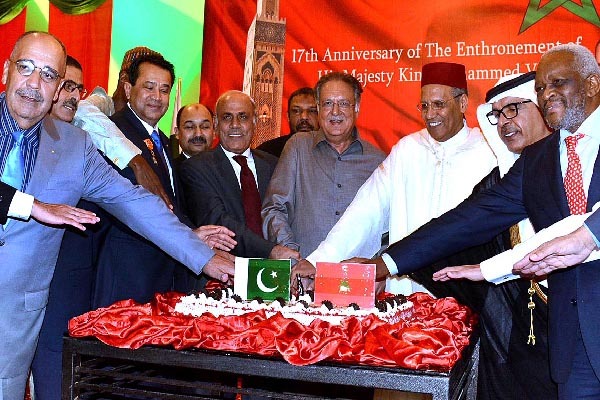 National Heritage Senator Pervaiz Rashid and Punjab Governor Rafique Rajwana were prominent among the guests, including diplomats, dignitaries and prominent citizens from different walks of life at the graceful event. Ambassador of Morocco to Pakistan Mustapha Salahudinne was host of the celebration and greeted the guests as they arrived. The ceremony started with the playing of national anthems of Pakistan and Morocco. heartiest felicitations to the government and people of Morocco over the anniversary. marked by mutual feelings of brotherhood and friendship.